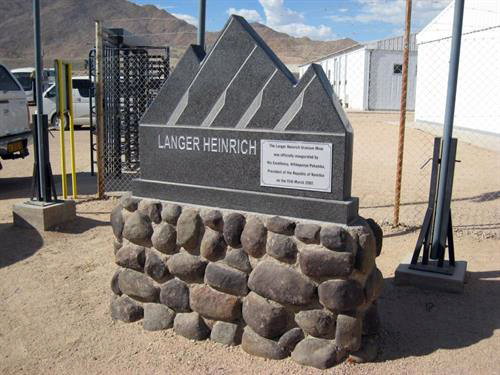 Langer Heinrich Uranium (LHU) is 75% owned by Paladin Energy Australia, with CNNC Overseas Uranium Holding Limited, a subsidiary of China Nuclear Corporation, holding the remaining 25%. LHU operates an open pit uranium mine located within the Namib Naukluft National Park, 90 km east of Walvis Bay in Namibia’s Erongo Region. The surficial, calcrete type deposit currently has a mineral resource of 149 million pounds containing 514 parts per million U3O8, and 5.2 million pounds are produced annually. The ore is treated with an alkaline leach and ion exchange process. Our mining license area is 40km2, of which less than 10% is currently utilised, making our overall operational footprint less than 4km2.